The cool, crisp colour combination of silver and sky blue suits the simple, classic lines in this jewellery. 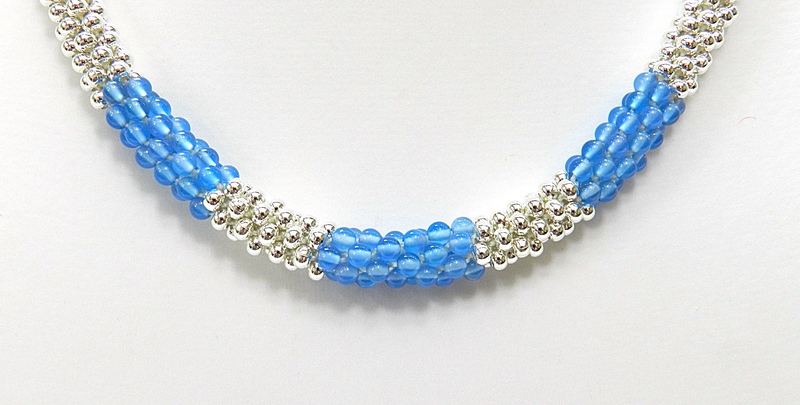 The addition of a chain made from beaded links keeps this necklace light and also saves on beads. 1. Cut 8 x 60cm S-Lon. 2. Braid for 2cm in Round Braid. 4. Braid in the beads and then for 2cm without beads. 5. Finish the braid with glue-in or wire-on end caps. A wire coil and a few extra beads can also be used. 6. 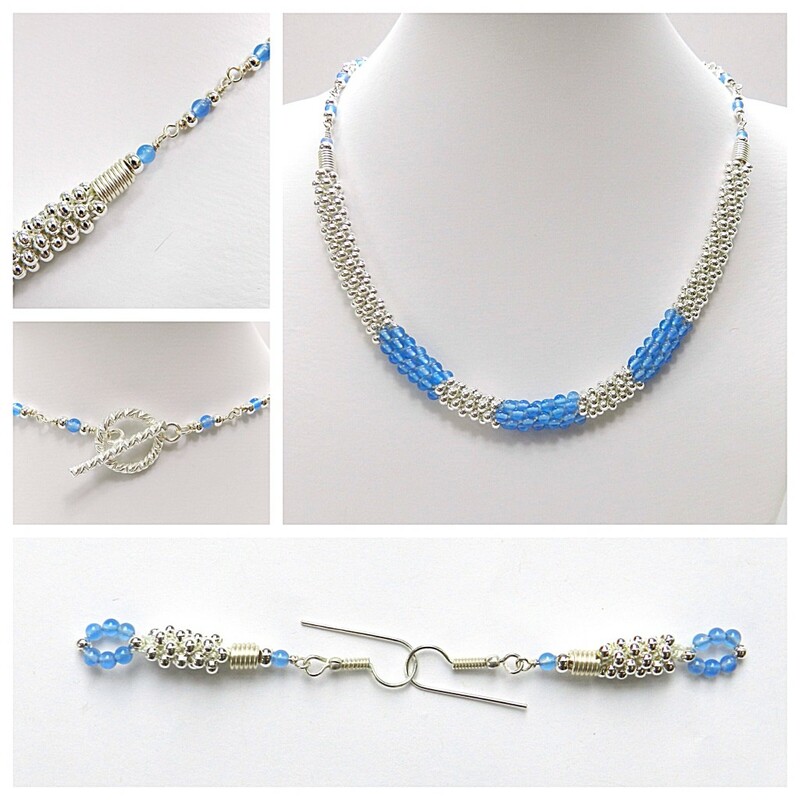 Make a rosary link chain using links made with two silver beads on either side of a blue bead. Approximately 6-8 will be needed on each side. These dainty earrings are perfect to make with a few leftover beads and they compliment the necklace perfectly. 1. Cut 4 x 35cm S-Lon cord. 3. Thread the first end of the cord through the last bead threaded on, so that the cords cross over and a beaded loop is formed. 4. Tie the other 3 cords onto the loop using the first cord and a double knot. 5. Position the cords on the disk for Round Braid and carry out 8 moves. 6. Thread 3 size 8 seed beads onto each cord and braid them in. Braid for an extra 1-2cm. 7. 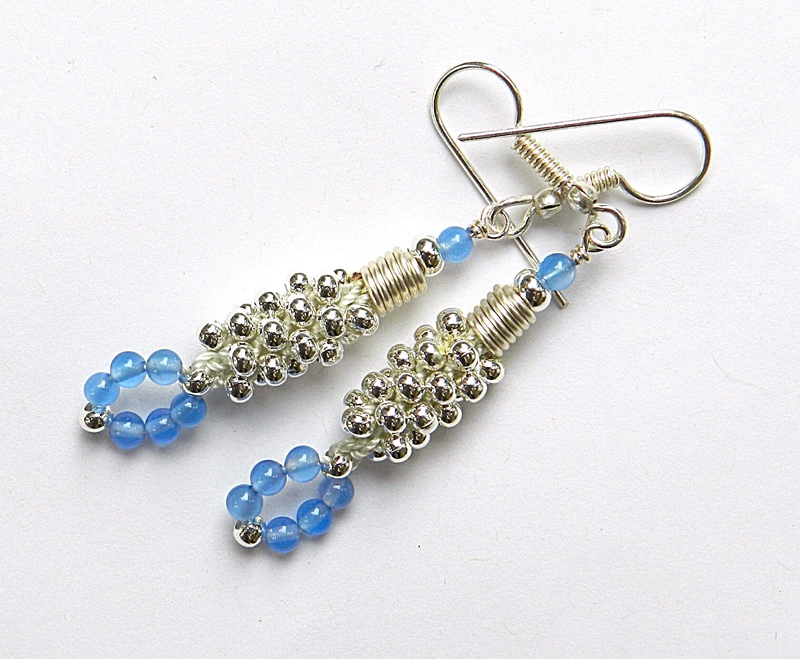 Finish off with a glue-in or wire-on cone or a spiral of wire, top with a couple of seed beads and a wrapped loop. 8. Attach the earring wire.